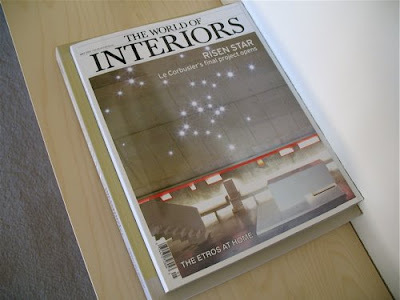 That's a favorite back issue of The World of Interiors. I never subscribed, but I once loved to flip through its glossy pages at Bookstop. The above cover photograph is of Le Corbusier's last architectural project - Saint-Pierre Church in Firminy, France. I love how light shines through the walls like a constellation as the sun moves across the sky. I have that magazine sitting atop a bookshelf in our library/TV room because the stars are just so purty every time I walk by. A look at cities in the films of 2008, and how they arm us with ways to look at our neighborhoods and daily routines in thoughtful ways. John Updike, RIP: the legacy and oeuvre. The new year means new art in Chelsea, and a new opportunity to feel the pulse of the art world. Harnessing the web to promote civility and goodwill. The intentional imperfections and brilliant life in painter Bruce Herman’s newest work.